The daughter of a dear friend of ours from Oregon has, rather surprisingly, gotten into dog training. It's become a passion and a calling for her, and she has so many awards lining her bedroom walls that they're starting to spill into the hallway. I've joked that they'll be able to wallpaper their bathroom next, but it's not much of a joke. 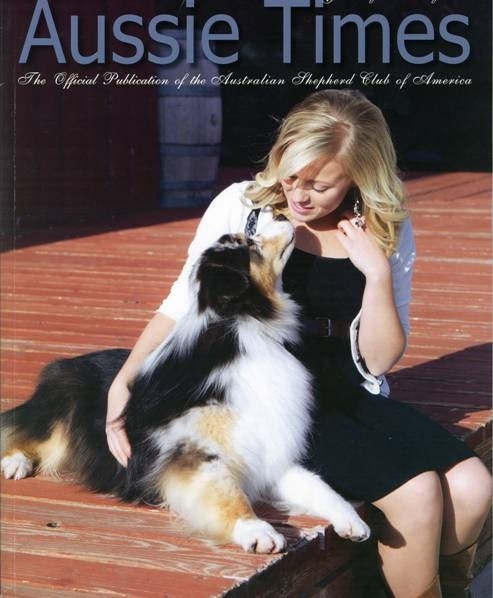 This young lady has earned so many awards with her training skills and her talented animals that it's astounding. Anyway, as a result of these accomplishments, she was featured in an issue of Aussie Times magazine. Whoot! 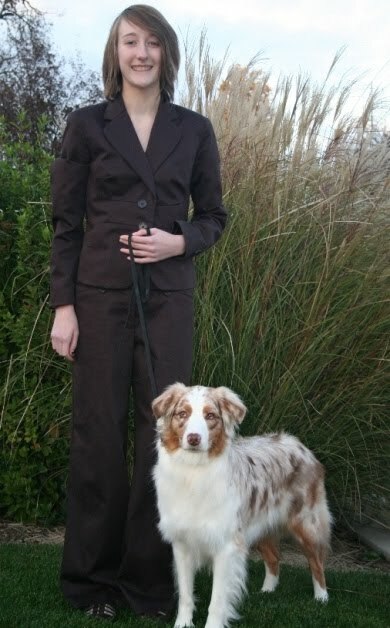 Emily P., 15, is pictured here with her two year old Aussie, Bella. Emily is a sophomore at a private Christian school and enjoys time with her family, friends, and her pets. She has three dogs, two pet rats, and a Kenyan Sand Boa named Mr. Stubbs. Emily is interested in working with dogs as a career, whether it be showing other peoples’ dogs or training the dogs for them. She’s also interested in perhaps having a training facility where people can bring their dogs to learn to work together as a team. Whatever God has planned for her, you can bet it will involve animals in general, and dogs in particular! Is this the same young woman whom you helped to get home over the holidays? She could be the next Victoria Stilwell. That young woman made a very big career out of dog training. A well-mannered dog is a good dog. I wish your young friend much success in her chosen field. Nope, different friends. But a most amazing young lady. That is a fine looking dog she has there. He must have received some first rate grooming to look that good. My poor old happy dog was never given that kind of luxury. NICE! :) I have a little Aussie myself and they are amazing dogs. It brings a huge smile to my face to see younger (im only 28 but still) people getting involved with dogs, training, and the like. It is so good for people. I seemed to always be the youngest in agility classes and competitions until recently. The dog world needs some educated younger people to set the standards for what is to come. Beautiful dog. And good for her! !